Yeah, I know … I’ve been lagging BIG TIME around here. Rather than bore you with all mundane, yet legitimate, excuses as to why, I think I’d rather share this delicious combo of American BBQ and south of the border flavors! Besides, wouldn’t you rather have a delectable new dish to try instead of being up to date on the daily trials and tribulations of an ordinary Neanderthal??? I thought so! 😉 These tacos are kind of a domesticated version of the famous Al Pastor taco found in most authentic Mexican taquerias. First thing you’ll need to do is follow the instructions for preparing one recipe of Dutch Oven R&R Pulled Pork. Be sure to start that recipe a day ahead, as you will have to marinate the pork shoulder overnight with some smokey dry rub – we prefer our homemade BBQ Rub-a-dub which was developed specifically for this recipe. Once it is in the oven cooking, you’ll want to get on making the R&R BBQ Sauce, which takes a couple hours of simmering on the stove top. By the way, don’t be afraid to try this sweet and spicy sauce on ribs, beef, chicken, or anything else you might barbeque. You’ll definitely want to top those tacos with some salsa (We’ll have to write up our simple and rapid salsa recipe for you soon … it will make you forego bottled salsas for good!) and some guacamole. 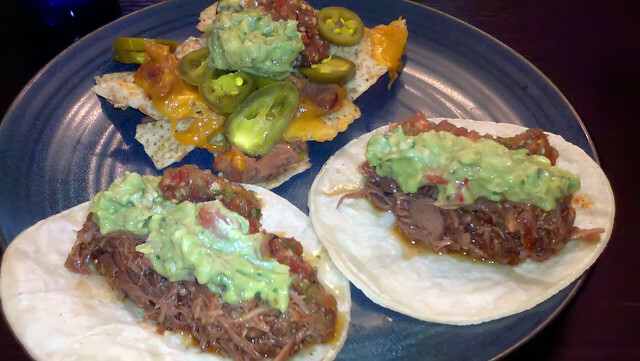 Since the Pulled Pork and BBQ sauce cook for so long, you’ll have plenty of time to whip up some Rockin’ Guac. Be sure to make extra, because not only are you likely to be nibbling on some before the meal, but you’ll also need some to go with the Nachos! Speaking of which, the recipe for our Gnarly Nachos is so simple, we are actually going to abandon the usual step-by-step photo instructions and just spell it out for you here. Take a medium sized baking dish or pan and lightly coat with non-stick spray. cover the bottom with a single layer of your favorite tortilla chips. Top the chips with scattered spoonfuls of refried beans (we use the vegetarian variety for the herbivores in our Cave clan), then cover with shredded cheddar cheese. Add another layer of chips, and repeat the process with the beans and cheese. Place in an oven preheated to 350° for 10-15 minutes, until cheese is completely melted and the beans are hot. When done, remove from oven and top with pickled Jalapeno slices, salsa, and guac. If you like, you can also add chopped tomatoes and onions, sour cream, cilantro … you name it! When the pulled pork recipe is complete, heat up some corn tortillas, top them with a healthy scoop of the tender meat and top with guac and salsa. I guarantee that the mewls of palatable pleasure you will hear around the dining table will be the perfect musical compliment to these devine dishes! ©2011 Caution: Caveman Cooking/UHearMe, Inc. All rights reserved. This originally appeared on the Caution: Caveman Cooking blog at http://cavemancooking.net authored by Caveman. This may be shared and reprinted as long as this entire copyright message accompanies it.